Diwali is approaching fast. People in India love to be with their loved ones during festivals and occasions. Actually, these are the most precious times to spend with friends, family and especially with our parents. From your very first day on earth till today, you have long been looked after by your parents and they did everything they could to make you the person you are today. Hence, in Diwali 2015, you should present them something significant to show your love and gratitude. Even if your professional commitments restrict you from being with them you can still make your presence felt by gifting something really helpful for them. Now the million dollar question is what could be the best gift for your elderly parents? Well, cards, flowers, bags, clothing have all become very cliché and not very useful as well. Your parents have reached the age when health insurance is the prime concern. Since they are on the wrong side of sixty now, medical expenses which is increasing by leaps and bounds every year can be troublesome for them. The health insurance sector in India is slowly but steadily coming off age. A few years ago, health insurance covers for senior citizens were not available. But in recent times there are quite a few insurers that have come up with senior citizen health insurance plans much to the delight of elderly people like your parents. Hence, you can lit up the face of your parents in this festival of lights by gifting them the best senior citizen health insurance policy available in India. There is no dearth of senior citizen health insurance plans in India. In fact, there is a massive profusion of such health insurance covers to choose from. If you are not familiar with the features, positive traits and limitations of a health insurance policy you may end up buying the wrong policy. Here are some common terms associated with senior citizen health insurance plans that you need to understand. In simple words, the premium is the amount that you have to pay per year to keep your insurance valid. The amount depends largely on the features included in the plan. Some people tend to settle for health insurance covers with low premiums. But you shouldn’t do the same as cheap health insurance plans usually don’t offer extensive coverage. You need to decide on the plan on the basis of your requirements and coverage provided in the plan but not in terms of premium. Usually general insurance companies offer sum insured in their health, motor, travel, home insurance policies. This is the highest amount up to which you will get coverage. Let’s resort to an example to make the concept clear. Suppose, the sum insured amount for your senior citizen health insurance plan is Rs. 3 Lakh and the hospital bill is Rs. 2.5 Lakh. In this scenario your insurer will pay the total amount, however, if the hospital bill is Rs. 3.5 Lakh; you would have to pay Rs. 50000 from your pocket as your insurer would pay up to the sum insured amount only which is Rs. 3 Lakh. Since, healthcare costs are increasing rapidly you should look for higher sum insured so that all the expenses can be kept under the coverage. After availing a senior citizen policy for your parent you need to renew it every year to keep it effective and valid. However, you cannot renew an existing senior citizen plan for an indefinite period of time. Most insurers impose a restriction in terms of age for renewal after which policies cannot be renewed. However, there are a few health insurance covers that come with lifetime renewal option and you should aim at securing one of such health insurance policies. Insurance providers usually offer a bonus to policyholders for not making claims in a policy year. This bonus is called No Claim Bonus and the rate differs from one insurer to another. Most insurers come with this clause which requires insured people to pay in time of settling a claim. You need to look for a policy with low co-pay so that you insurer would pay the maximum amount. Most health insurers don’t cover certain ailments until a certain period of time which varies between 2-4 years. Since you are looking for a senior citizen health insurance plan for your parents you need to find a policy with least waiting period because fatal diseases occur when one gets older and if the policy doesn’t cover the diseases it is of no use. All policies come with particular waiting period. Policyholders can make claims only when the waiting period is over. So, your obvious choice would be a health insurance policy with least period for waiting. Insurance companies typically come with limits and sub-limits within the entire Sum Assured amount. This clause is not favorable for policyholders. So, you need to find a senior citizen policy without any sub-limits for your parents. After understanding all the intricate insurance terms the last thing you need to do is assess the quality of the insurance provider. You need to check the previous track record of insurance firms when it comes to claim settlement. Finally, your chosen senior citizen health insurance policy should have extensive coverage that includes pre-existing illness and critical illness plans within your budget. Before settling with any particular plan you should also check out the list of exclusions. You have to find a plan with shortest list of exclusions. Now that you are aware of the features of a senior citizen health insurance policy you can easily find a host of plans to compare with. Here is a list of top senior citizen health insurance plans offered by leading general insurers operating in India. These policies are meant for couples. 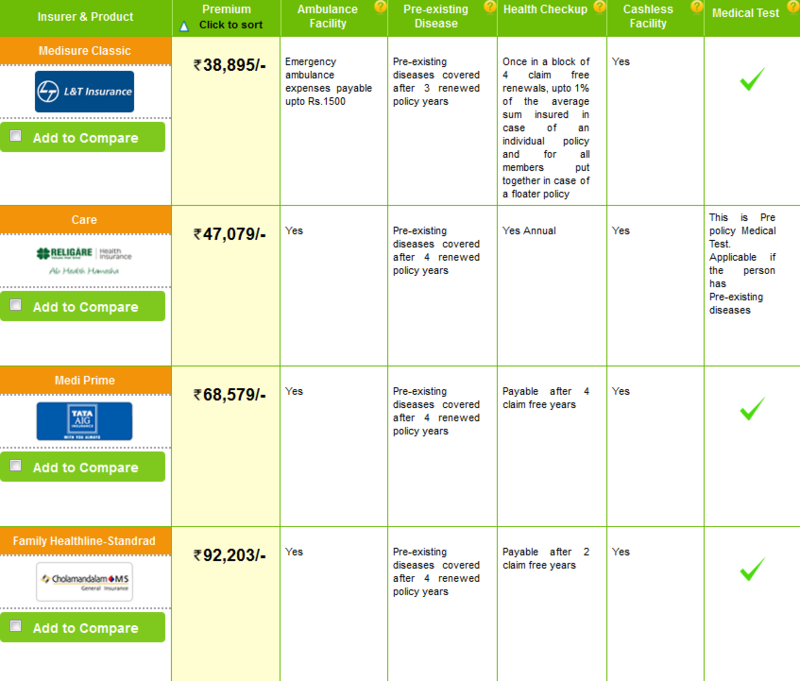 The chosen Sum Insured amount for these health insurance covers is Rs. 5 Lakh and tenure is 1 year. Assuming your parents age are 66 and 61 respectively and none of them has any pre-existing disease. There are 4 health insurance plans as per the criteria and all of them cover critical illness. You can select any of these 4 senior citizen health insurance plans as per your requirements and budget. However, as far as the features are concerned The ‘Care’ plan by Religare is by far the best among the lot. The plan offers coverage for organ donor and doesn’t impose limits on various expenses such as ICU charges, doctor’s fees and other medical Charges. The policy further offers free annual health insurance check up irrespective of claim history. The best part is, you can select Sum Insured as much as Rs. 60 Lakh if you want to. 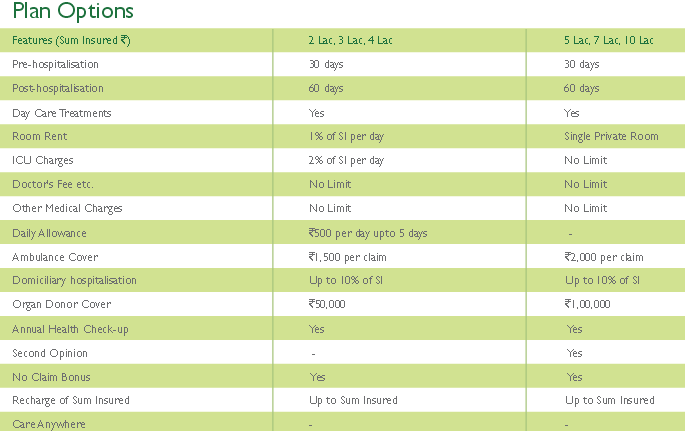 Here is a plan details for your chosen Sum Insured amount, Rs. 5 Lakh. If you are interested to avail this plan you should be aware of the policy terms as well. It has all the prerequisites to be an ideal health insurance cover for senior citizens. There is a very short waiting period of 30 days except injuries. There is no maximum age limit to opt for this plan and the option for lifelong renewal is also available. Instead of buying a senior citizen health insurance plan for couple, you can also gift your parents individual plans. The advantage of buying an individual plan is the total Sum Insured amount will not be shared. In the previous instance, the sum insured amount of Rs. 5 Lakh is shared between your parents. God forbids, if both of them fall sick, the sum insured amount may fall short of actual need. But if you gift them individual senior citizen health insurance plans, both of your parents can make the most of the entire Sum Insured of Rs. 5 Lakh. Here is a list of top 5 individual senior citizen health insurance covers as per the criteria same as above for you to choose from. Out of the 5 senior citizen individual health insurance policies, the one called ‘Red Carpet’ by Star Health Insurance is undoubtedly the best. The plan not only beats other policies in terms of premium but features are also unparalleled compared to other plans. Pre-existing ailments are covered from the second year and the option for lifelong renewal is also available. Most importantly, there is no TPA involved in the claim settlement process at Star Health insurance, so you can expect speedy and hassle-free claim processing. Since the nature of illness is unpredictable, here is a complete break-up of the expenses that is payable under the plan for different kind of diseases. Finally, you need to read and understand the policy wordings thoroughly. You need to pay attention to claim settlement procedure as you can’t expect your parents to be aware of the terms and conditions. The very purpose of presenting your parents a senior citizen health insurance cover is to keep them protected from financial expenses arising out of health insurance hazards. If they cannot utilize the health insurance policy when they need it most the whole purpose will be defeated. You can rest assured that senior citizen health insurance plan will prove to be a lovely surprise gift for your parents. You parents will not feel happy but will also appreciate your sense of responsibility. You will show them that you have grown up in the true sense of the term by presenting your parents the best senior citizen health insurance cover available in India. 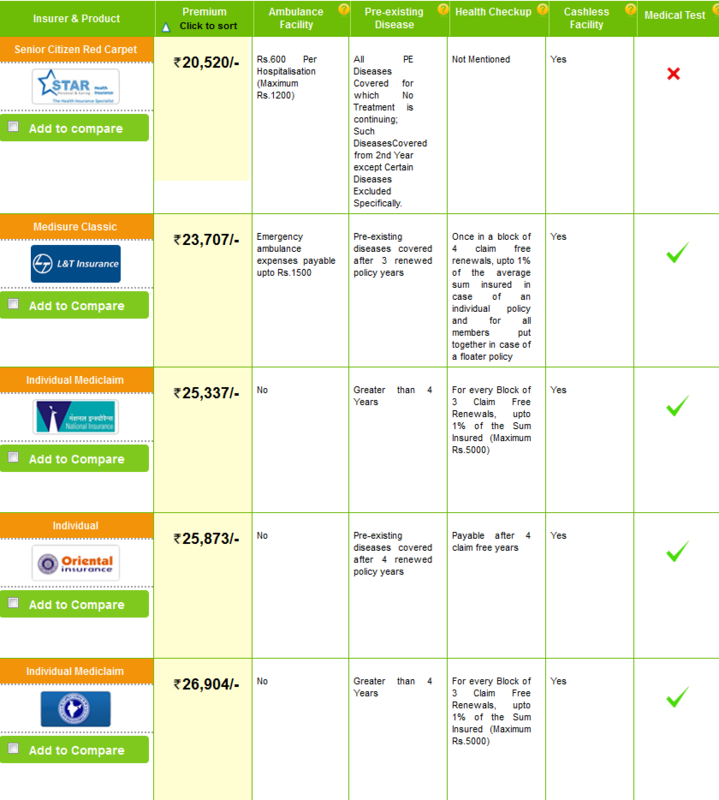 Comparing and buying online insurance is all the rage in India these days and some online insurance comparison portals have come into existence to help common people like you compare and buy the best insurance policy. You can easily visit GIBL, the premier online insurance comparison portal in India to compare and find the best senior citizen policy for your parents at the lowest price.